Peter Schmitz (standing) and Peter Levine in Murmurs and Incantations. Photo by Dahn Hiuni. BOTTOM LINE: Murmurs and Incantations is an elegant play about a Jewish artist’s struggle with his past, as well as the power of spoken words. Murmurs and Incantations follows the story of New York artist Ben (Peter Levine) as he faces the demons from his past as well as the obstacles at hand. Ben has gone fifteen years without creating a single piece of new work, instead teaching performance art for a living. Eva Gorzelak (Isabella Knight), a curator in Poland, reaches out to Ben about doing a show in Warsaw, where Ben was born and raised. Eva was Ben’s childhood friend, and her family saved Ben from the Nazis during WWII by hiding him underneath the floorboard for two years. Terrified by the idea of reliving the past, Ben struggles to make the decision to reconnect with Eva. Encouraged by his best friend Lane (Peter B. Schmitz), Ben eventually sets off to Poland to start anew with possibly the first work in many years. As the show approaches, Ben becomes increasingly haunted by characters from the past. The ghost of his grandfather Dovid Shulevitz (Schmitz again), who died during the Nazi occupation, becomes his guidance as Ben visits the monument of the Holocaust. 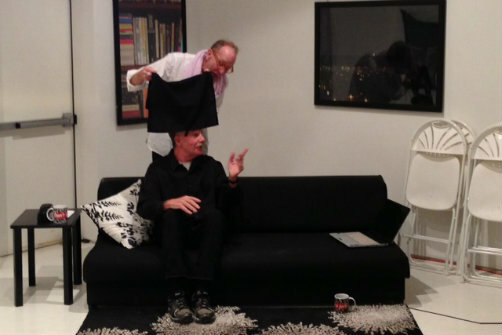 As Ben finally begins to tape his performance in the gallery space provided by Eva, his former lover Michael (Joey Gambetta), who died from AIDS, appears as an encouragement. It is a refreshing feat seeing a play that is elegantly written, skillfully directed, and eloquently performed. The story is told with simplicity and grace. Schmitz’s portrayals of Lane and Dovid are both vivid and distinct. With a mere switch of the costumes, different temperaments come alive in a split second. The transitions between scenes under Lewis Magruder’s direction are seamless and without disruption. A few chairs on the stage of Soho Playhouse morph together and set up the atmosphere of a gallery, a university classroom, a cemetery, and more. My only suggestion is to improve the projection of Ben performing at the monument so that this technical feature (always a struggle in Fringe shows) aids the storytelling instead of distracting from it. As the actor sits on stage, a rigged IPhone films his motions live and projects them onto the background. Its purpose isn’t clear especially since Ben creates live performance art as opposed to videos. Devising a better way to incorporate projections would make this an exciting moment that transports the audience to the very space imagined in the outskirts of Warsaw. Murmurs and Incantations is by Dahn Huini. Directed by Lewis Magruder. Scenic, Costume and Projection Designs are by Elizabeth Schweitzer. Music by Yuval Ron. The cast is Peter Levine, Isabella Knight, Peter B. Schmitz, and Joey Gambetta.